CHENGDU, China--(BUSINESS WIRE)--Facebook just launched its Messenger Platform at Facebook’s F8 conference 2015. Fotor worked with developers throughout the industry on the Messenger Platform prior to Wednesday's launch, resulting in features for users including the ability to install Fotor with one click of the install button on images sent by friends via Fotor and automatic switching to Fotor app via the reply button. Before Facebook’s launch of Messenger Platform for app developers, Fotor has already established itself as a popular photo editor, featured from basic editing (crop, effects, filters, stickers) to cutting-edge technology of HDR (High Dynamic Range) processing. Fotor is set of tools available across platforms (iOS, Android, Web, Desktop for Mac and Windows) that allow everyday users to edit, transform, customize and share their images to social networks in an easy, funny and intuitive way. There are all together more than 100 million Fotor users all over the world. Every day there are more than 150,000 people who have become its new users and more than 2 million photos are edited with Fotor every day. These numbers continue to grow exponentially through the world. Fotor’s success is in no small way attributed to its utilization of Facebook and Instagram in cultivating an extensive international user base. The integration of Facebook Messenger into the mobile Fotor app will give the user the ability to instantly send enhanced and modified images to Messenger contacts from Fotor, while the other party can display the option for a person to install Fotor from within Messenger, or to reply using content from the app. With over 600 million users, Facebook Messenger is a popular messaging service allowing users to interact from a mobile device, making it a perfect app to be synchronized with Fotor. It is irrefutable the integration of these two platforms will provide users of both services greater options. Despite this growth however, Fotor’s mission has remained the same, to provide the most user friendly photo editor for professional and amateur photographer alike. The cooperation between Fotor and Facebook represents a step in the app’s organic growth and will allow for greater technological advances further improving Fotor’s already established platforms. 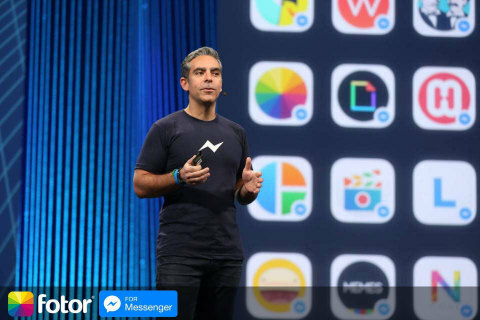 Fotor has been one of the first 3rd party apps integrated with Facebook Messenger Platform at F8 Conference 2015. The integration provides users of both services greater options and better experience.